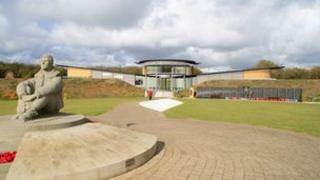 A building in the shape of a double Spitfire wing could be built at a Battle of Britain memorial in Kent. Plans for the new visitor centre at the National Memorial to the Few, at Capel-le-Ferne, near Folkestone, have been submitted to Dover District Council. The Battle of Britain Memorial Trust said the £2.5m building, to be called The Wing, will not be a museum. Modern technology will be used to bring to life the experience of those who took part in the famous battle. At the centre of the two wings will be a first floor viewing area and balcony with views across the Channel to the French coast, from where the Luftwaffe would have appeared in the summer and early autumn of 1940. As well as exhibition space, the visitor centre will have a study area, shop and cafe. The Trust is hoping to get National Lottery money to help fund the building and fitting out of the new centre, which has been designed by local architects Godden Allen Lawn.